Study Shows Increase In Babies' Deaths Due To Crib Bumpers : Shots - Health News Those adorable padded bumpers shown in baby-gear catalogs can be a hazard, and researchers say babies continue to suffocate even though a federal agency has told parents not to use them. Babies have suffocated after being trapped in padded crib bumpers, according to the Consumer Product Safety Commission. Flip through a popular children's furniture catalog and you'll find baby cribs with bumpers — a padded piece of fabric that ties around the wooden slats, making the crib look cozy and cute. The problem, researchers say, is these bumpers can be deadly, because babies can get caught in the fabric and suffocate. "They are dangerous; don't use them," says Dr. Bradley Thach, a professor emeritus of pediatrics at the Washington University School of Medicine. Thach was the author of a landmark study in 2007 that first documented crib bumper deaths. He says things have gotten worse since then. Thach is one of the authors of a study, published Wednesday in The Journal of Pediatrics, that shows the number of deaths attributed to crib bumpers has increased significantly in recent years. Using data reported to the Consumer Product Safety Commission, an independent federal regulatory agency that oversees consumer products, the study found that 23 babies died over a seven-year span between 2006 and 2012 from suffocation attributed to a crib bumper. That's three times higher than the average number of deaths in the three previous seven-year time spans. In total 48 babies' deaths were attributed to crib bumpers between 1985 and 2012. An additional 146 infants sustained injuries from the bumpers, including choking on the bumper ties or nearly suffocating. "These deaths are entirely preventable," says N.J. Scheers, the study's lead author and former manager of the CPSC's infant suffocation project. Babies either got their face caught in the bumper and couldn't breathe or they got wedged between the bumper and something else in the crib. In all of these instances, Scheers says, "If there were no bumper, the baby would not have died." Bumpers were originally intended to stop babies from falling out of the crib; regulations now require the wooden slats to be narrower. Bumpers were also designed to prevent babies from bumping their heads or getting their arms and legs caught in the rails. But Scheers says a sleeping sack is a safer way to keep arms and legs safe, and a little bump on the head is not worth the risk of suffocation. The American Academy of Pediatrics and the American SIDS Institute have both issued warnings about crib bumpers; they advise parents not to use them. But Scheers says when parents go to buy a crib, they see them decorated with bumpers and say, "if they are dangerous, why would the stores be selling them?" The safest choice is a crib with no bumpers, pillows or quilts, according to the CPSC. In 2012, a voluntary industry standard was revised to decrease the thickness of the bumpers to 2 inches or less, with the hope that thinner bumpers would be less likely to cause suffocation. But this most recent study found that three deaths occurred with the thinner bumpers. 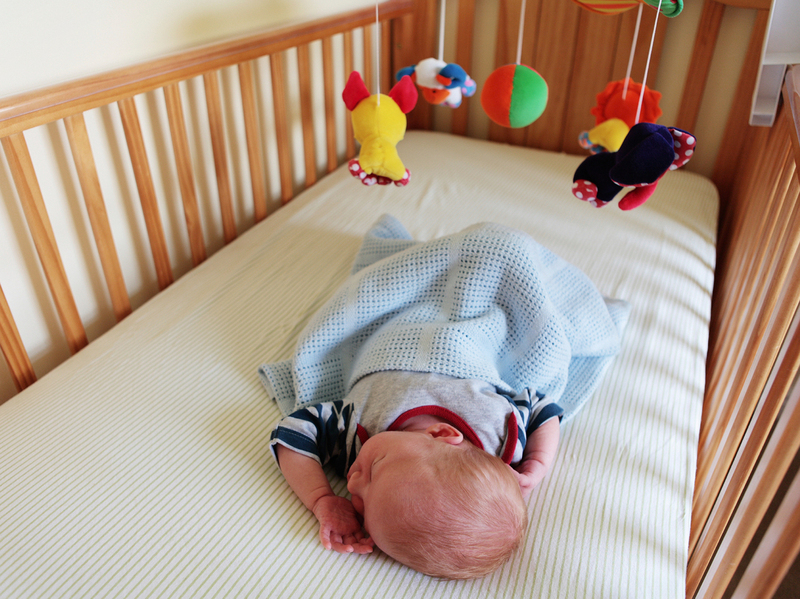 In 2011, Chicago became the first city in the country to ban the sale of crib bumpers. And in 2013, Maryland also banned the sale of crib bumpers with two exceptions: mesh or breathable bumpers made of thin fabric that allow air to pass through, and vertical bumpers that wrap around each individual crib rail. Scheers wants a similar ban nationwide, with the caution that mesh and vertical bumpers still need to be studied because there's no data available to prove they are safe. The CPSC is currently in the process of putting forward a recommendation on how crib bumpers should be regulated. In the meantime, it recommends that "Bare is Best" — the safest way for a baby to sleep is in a crib with nothing but a tightly fitted sheet.